Nutella & Go! is the winning snack that lives up to its name because it won’t stay on the shelf long. This snack goes! In fact, it broke $100MM in retail sales as a brand L52 weeks. * And right now when you buy one box each of Nutella & Go! 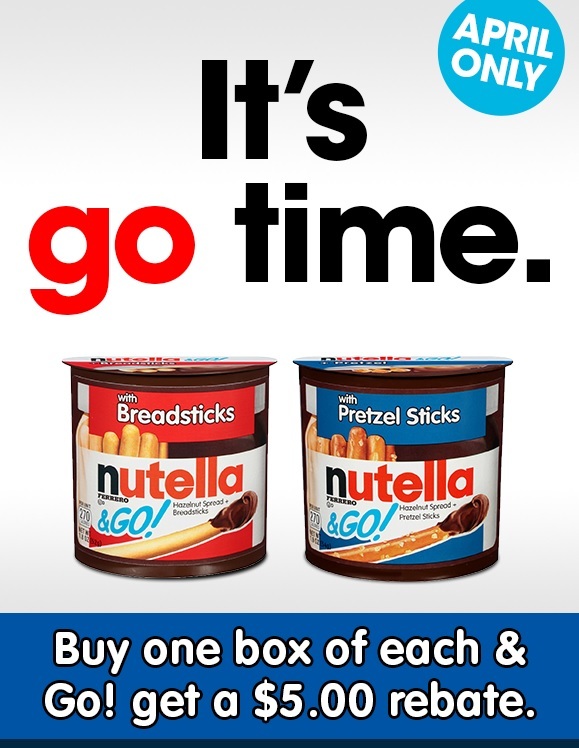 Breadstick and Nutella & Go! Pretzel you’ll get a $5.00 rebate. Stock up now! NUTELLA & GO! BREADSTICKS 12-ct. box | Stock #80314 | 1.8 oz. NUTELLA & GO! PRETZELS 12-ct. box | Stock #80401 | 1.9 oz.